I miscalculated both bentos. 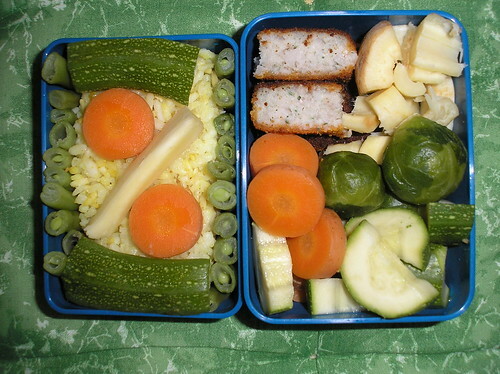 For monday's bento I took too few vegetables out, for today's bento I had too much. It wasn't a big problem, because I could fill yesterday's up with corn and peas and ate the left over carrot and parsnip as breakfast, but it still is annoying. Probably my last evening primrose blossom this year. The plants still have buds, but most didn't blossom in the last week and it started to freeze at night. I collected seeds and seeded some for the year after next year (they blossom in the second year). I hope, the birds didn't eat them. 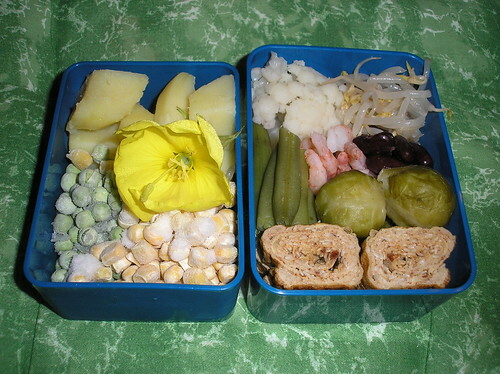 The bento contains leftover potatoes from sunday lunch, peas and corn because there was a lot of space left, cauliflower, bean sprouts, green beans, kidney beans, prawns, brussel sprouts and tamagoyaki, coloured with paprika and filled with sesame. Tomorrow I wont make a bento. I will be on a workshop with customers and we will go out for lunch. In the evening I will go to a concert by Michael Bublé with them (I was so surprised when they asked me O.O). There wont be enough time to go home between work and the concert, so maybe I can go to an asia market. I need anko, I want to eat daifuku.